Yellowstone Bison Release Launches Criminal Investigation Fear of disease has kept dozens of bison penned in Yellowstone National Park, until they were discovered to have been released through a cut fence. 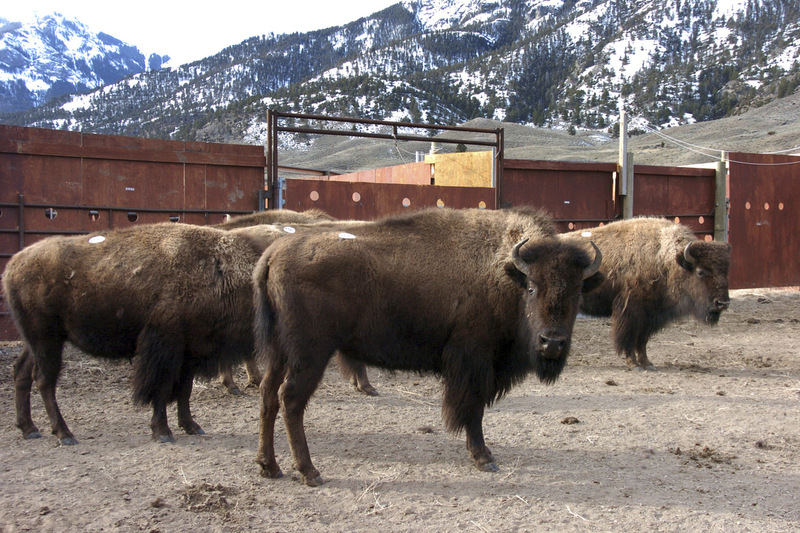 A group of Yellowstone National Park bison are in a holding pen in March 2016. Park officials are now looking for 52 bison that made a run for it after someone cut a hole in their holding pen. On a windy and unseasonably warm winter day in Yellowstone National Park in Montana, spokeswoman Morgan Warthin stands in the middle of a massive, empty valley. "Yellowstone is so big," she says. "Where do you begin to look?" She is searching for any of the 52 bison that were set free from two holding pens in mid-January. Authorities say the bison escaped after somebody used bolt cutters to open up a fence. They soon scattered across an area larger than Delaware, and officials have launched a criminal investigation to find out what happened. "I didn't believe it when I was first told," says Rick Wallen, a park bison biologist. Finding these animals won't be easy, according to Wallen, because there are thousands of bison in Yellowstone. The only thing that sets the escaped animals apart is a tiny ear tag, which can be hard to spot from long distances. "Bison, in the winter time, are incredibly furry animals," Warthin says. "And so the fur, being so thick, covers up those tags. So it makes it very difficult to find the tag." Before the bison went missing, Yellowstone park officials hoped to send them to a nearby Indian reservation in Montana. It was part of an effort to help the animals avoid what has become an annual and controversial slaughter of bison from Yellowstone. Over the past decade, the park — under court order — has sent hundreds of bison to be killed almost every year because nearby ranchers fear the animals could infect their cattle with a disease called brucellosis, which can cause pregnant cows to abort their young. However, there has never been a confirmed case of bison passing on brucellosis to cattle in the wild, and Wallen said the fear is exaggerated. Ranching is big business in Big Sky Country. So the Park Service hoped it could save some bison otherwise headed to slaughter by first quarantining them and then creating a new herd on the Fort Peck Indian Reservation. The animals lived in the holding pens for more than a year while the Park Service worked with Montana and the U.S. Department of Agriculture to get the pens approved as a quarantine. Then someone cut the fence. "A lot of hard work was put into testing these animals," Warthin says. "All that work, all that effort is gone." Now the question is who allowed these animals to escape. Rick Wallen said he suspects animal rights activists could be involved because they hate seeing wild bison contained in fenced facilities. But Chris Hurley, a coordinator with the Buffalo Field Campaign, said his group had nothing to do with the animals' escape. "Something like that from the campaign would be kind of detrimental to anything we're trying to achieve," he says. That being said, he is kind of happy someone cut the animals loose because he believes all Yellowstone bison should roam free. "Once they're in that facility, they will never be wild animals again," he says. "After years of domestication and being fed and being watered just to be shipped to end up on lands behind a fence somewhere is just insulting to our national mammal." Park officials said they've spotted some of the missing bison more than 5 miles away from the holding pens. They won't round them up like cattle because it's too far away. Instead, they hope the bison return on their own.